Sam Peterson of Boy Scout Troop 6224 contacted Angel’s Wish about working with us on his Eagle Scout project. We put our heads together, and decided building scratching posts would make a great project. Sam did lots of planning and estimated all of the supplies needed. Brunsell Lumber gave a generous discount on the supplies for the scratching posts, which included over 10,000 feet of sisal rope! Thank you Brunsell! 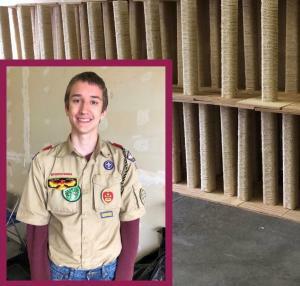 Sam organized his fellow Scouts and spent 182 hours creating 100 scratching posts for Angel’s Wish. We can put these posts in our foster homes so our kitties learn good scratching manners, or sell them in our retail store. Thank you, Sam for a job well done.